Hub + is an exciting day of games, activities and workshops for young people to engage in during the school holidays. 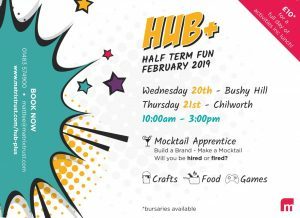 This edition of HUB+ features ‘Mocktail Apprentice’ where young people work together to build a brand, make a Mocktail and present to a panel of judges who will decide whether they are hired or fired. We will also have all of the usual Youth Hub activities including; games consoles, messy crafts and cooking!